Class schedules are an integral part of any educational institutes which can be a school, college, university, or even private coaching institutes. 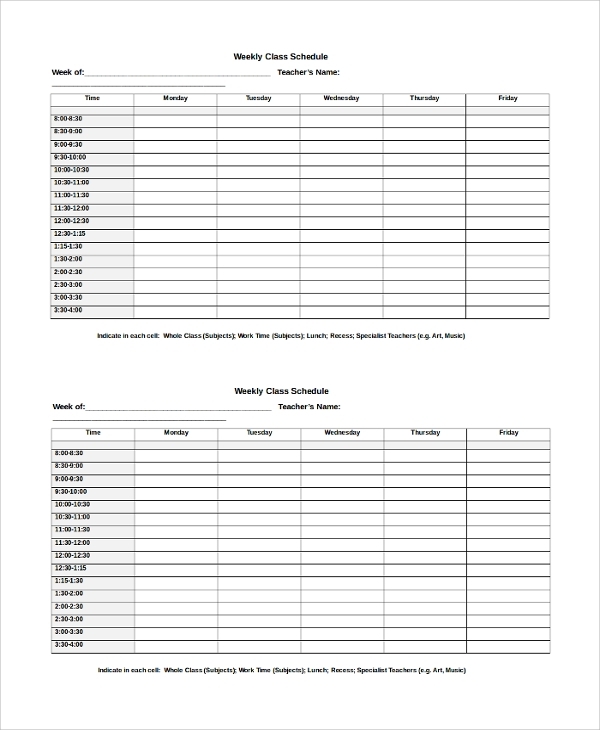 The following Sample Class Schedules have a simple design and convenient format which are tailor-made for writing teacher’s name and weekly dates. They can also be used in offices and working organizations to mention the tasks that the employees should complete within a given time period. They are fully editable and can be changed according to the requirement. There are spaces to write special notes and important notice. 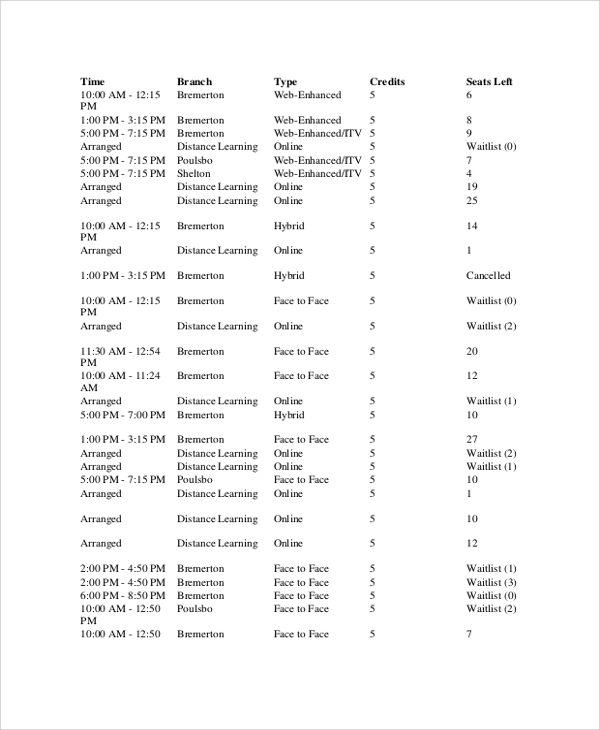 This is a complete college class schedule in a tabular format. It has a provision to write the section name to where the students belong, the course titles, course starting dates, available seats, enrolled, total capacities and how many of them are on the waiting list. This schedule is useful during admission and it is fully editable to change the column names and size and prepare it according to the need. This is a simple and traditional daily life or class schedule. It is helpful for an individual to be disciplined in life and it will help him in taking out time to execute different tasks as per the need. There is space to write special notes and the columns are kept blank to insert the time slot as per the requirement. This is also useful for hostel guys to remind them of the daily schedule and it can keep changing on a daily basis. 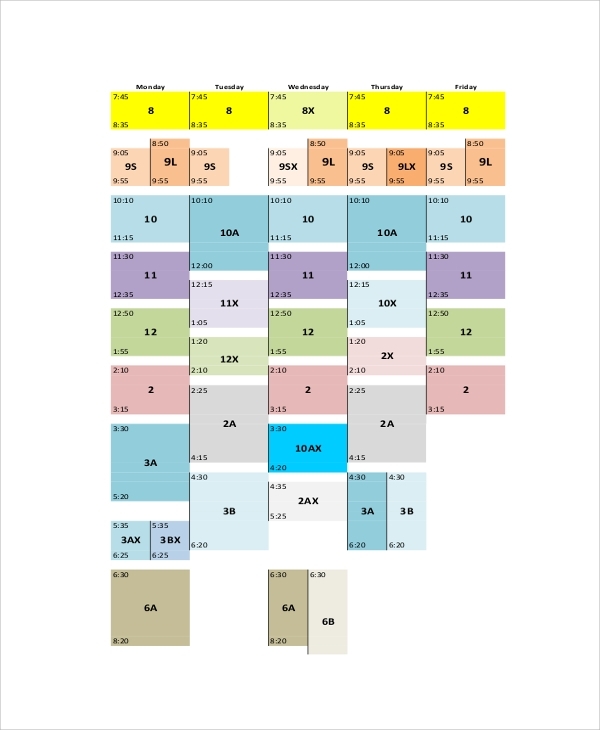 This is a traditional blank weekly class schedule. 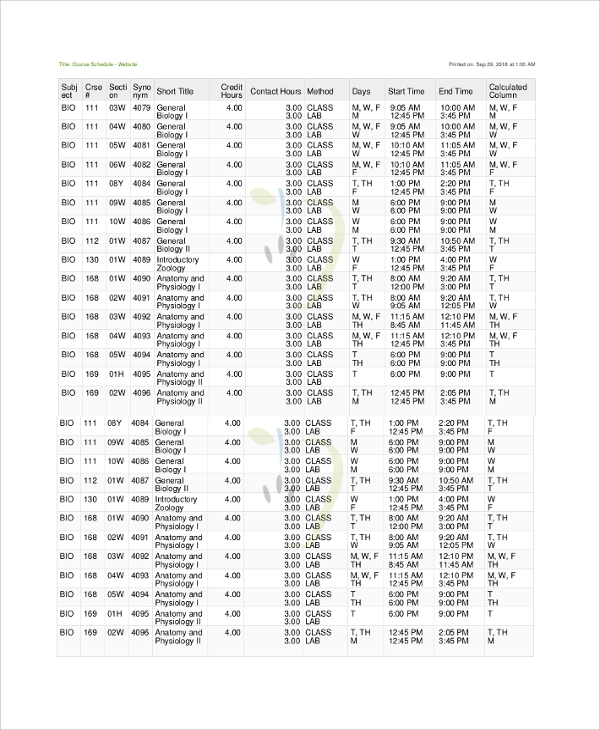 It is available in a tabular format and time is divided into half an hour starting from 8 AM to 4 PM. It has 16 rows and 6 columns including the one that mentions the time period. This chart is very important for educational institutes and such charts can vary from week to week. Therefore, there is space for writing which week it belongs to and the teacher’s name who will be conducting the classes. Class schedules are mandatory for any educational institutes to display the time slots and associated classes so that student can keep track of the subjects and courses. They are also useful for coaching institutes to let the students know which teacher is going to take classes at what time slot so that they can be ready and present at the right time. Such schedules can also be used in offices to keep track of tasks that employees are supposed to do to achieve the targets in due course of time. The targeted audiences for Class Schedules are the students and the teachers as well. Such class schedules are formulated in consultation with the teachers as per their availability. They act as guidelines for students and time schedule for teachers to follow in daily life. They can also be used in offices to schedule the work so that employees can follow them and target different tasks at a scheduled time. It helps the management to keep track of the employees easily. Such class schedules help students to follow time slots effectively and prepare themselves according to the subjects. 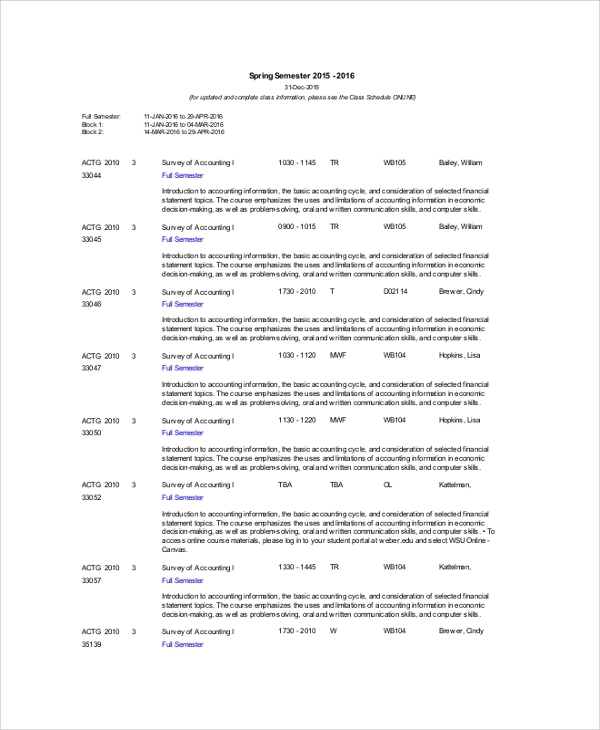 This is useful for teachers to adhere to a schedule and keep track of the upcoming classes. In professional work, it helps employees to follow the tasks they need to perform in a defined time slot and keep achieving targets. It helps the management to divide the tasks among employee for better output. 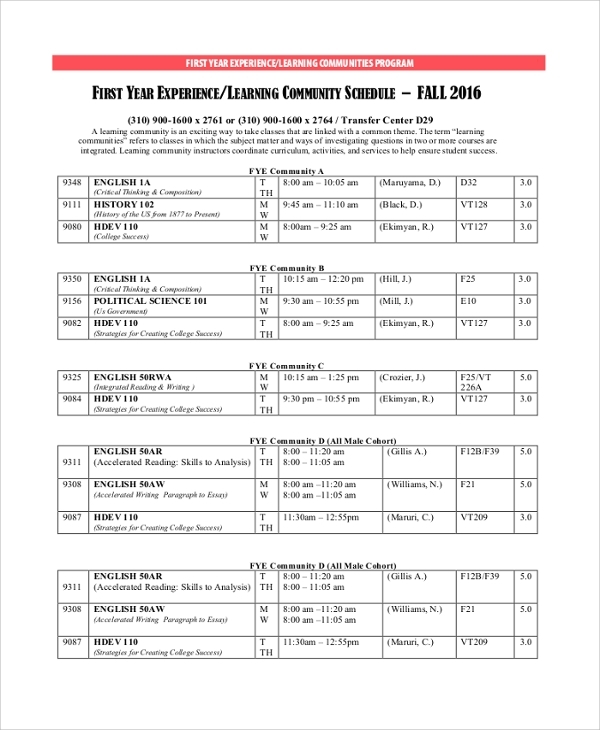 The sample class schedules listed above are mostly blank and they have Work Schedules according to which the classes can be held. They can be used in offices and other working organizations to complete defined goals and tasks within a given time period. 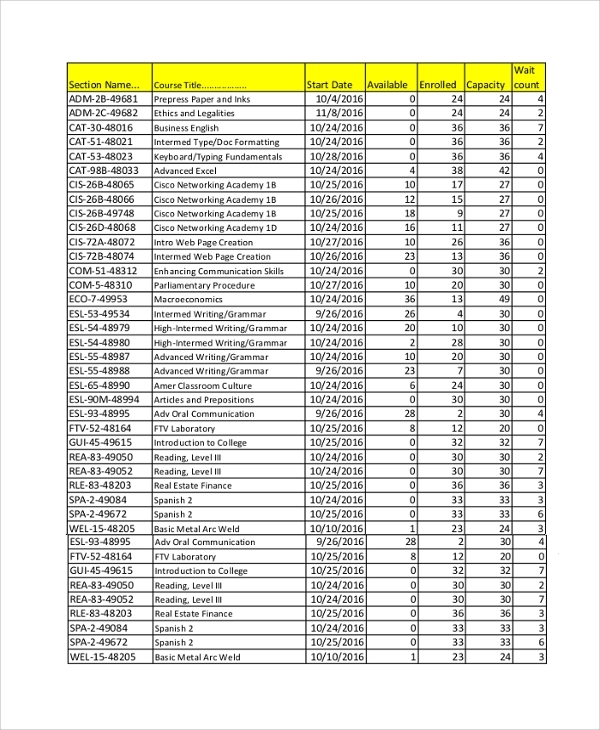 They are also useful for putting up course details during admission to let the students know how many seats are available in different courses and when the classes are going to start.